I was approached by a lady from Arrianna Publishing through oDesk to consult on a large MMORPG game they were going to get funding from KickStarter. I went through their storyline and went over the level that had been built and offered them a critique. To start with the structures that had been built looked like 18th century English Manor architecture. When traversing the house there were hallways with rows of armored knight type statues taking up several million polygons with giant 2048 textures..and they were dead ends. There were no staircases or hallways to continue down. You had to make a u-turn and go back out of them. This is not good level design. In my thinking every direction should lead you somewhere and to take you down a dead end and waste millions of polys on decorative statues with no significance is simply that… a waste of polygons. They did have a good set of concept art. I went over the storyline and it was very linear and involved a little over a dozen main characters and the conflicts between the five planetary realms. Pondering this in it’s format there was really no way to engage a community as the storyline was about these people with a head demon and his minions tossed in as the major protagonist. It would essentially have come down to 12 to 20 people playing the game and the rest of the players watching them and forming an army for various conflicts. I sent them back a critique and I presume they agreed with me as they fired the whole crew and dumped it all..the artwork, coding and game design in my lap. The concept I came up with I called a “Round Of History” with an underlying economic and political simulation where history kept repeating itself with variations based on the previous round of history and the winners trade and good wise of he previous round would then took on the parts of the main characters as Performers. The storyline would be a multi-branching timeline trajectory whose each strategic decision and outcome would drive the gameplay for the next 24 to 36 hours. The timeline I devised took this form as shown in the image below. 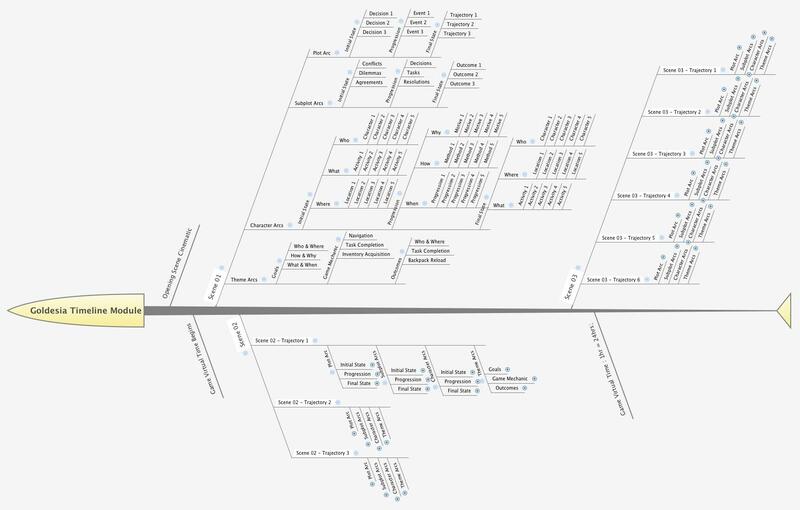 When the storyline was composed using this multi-timeline trajectory for each “Round Of History” it appeared as this type of structuring of the events, using their storyline and characters but allowing the story to be driven by gameplay as opposed to be locked into a linear format more suitable for a movie. The Game Design Document I wrote up is as follows. The Sacred Bloodlines of Goldesia will soon be defiled with hybrid evil through an impending marriage of the Princess of Goldesia’ to the Chief Demon Leviathan to satisfy the perceived terms of a demonic pact or contract the Princess’s father, the King made to save his Queens life during the birth of his daughter, the Princess. A loyal and brave Knight of the Realm of Goldesia, Avastya, will do anything within his powers and abilities to stop this demonic pact from coming to fruition. Until the Chief Demon is dispatched from Creation he will be unable to take the Princess’ hand in marriage himself keeping the Sacred Bloodline genetics intact. The actions undertaken on this quest upset and realign a perilous political and diplomatic situation amongst the other planetary realms of their solar system. The game is a multi-timeline Player driven narrative set in a Solar System of five disparate planetary realm cultures and societies. The game will feature a constrained timeline paced story arc trajectory whose current set of conditions will affect the subsequent timeline forking and alter the narrative. In essence it is an interactive social political and economic simulation whose moral, ethical dilemmas and inter-personal decisions drive the narratives trajectory. Underlying this driving structural framework will be a sandbox environment for Crafting, skills building, and contracting for Substantial Consideration for driving of Realm World economic factors. The storyline will be different every time the Players progress the narrative through from initial state through to one of the final outcomes, called a “Round of History”. It can be thought of as a series of chapters whose paragraphs constructions brings forth a different reading of the tale and of consequences, the nature of particular events occurring or decisions made or interpersonal conflicts hilighted or resolved causes the subsequent series of events and decisions to be made to unfold in a different manner. Behind the storyline trajectories sit the conceptual Planetary Realms themselves, each with their own set of political, economic and cultural structures. These are populated by Denizens, other Players Avatars. The Denizens of each Planetary Realm have trades customary to their resources, political setup and the evolving overall simulation as it becomes necessary to specialize or expand trades even further. If they choose a Crafting Trade they will be given a Crafter Bench module with tools and basic Recipes appropriate to their chosen TradeCraft and they can then begin collecting MaterialComposites for and subsequently configuring. Through Crafting they can Manufacture Objects from Raw Material, and Invent or Discover configurations leading to the availability of an increasing array of gadgets, weaponry styles and types of technologies. Crafters will have the ability to sell these items to other Players and in the true nature of the marketplace, the other Players interest in possessing any Object is up to the individual Player and the price set between those Players by contract, agreed to then the substantial consideration offered by each party to that contract is exchanged between Players. Players who choose one of the Martial Trades will be equipped and a “DoJo” entered where they will train according to their Martial Trade and equipment chosen. They can participate in PVP Round Robin styled elimination Honorary Challenges to establish their ability level in the hierarchy of those specialized martial Tradesmen, whether Soldier or Mercenary or Sovereign Citizen.They can then sell their proficiency and ability to use the weapon as a Soldier in Combat in one of the Realm’s Royal Armies. The Soldier in Combat is paid from that Realm’s Planetary Treasury on a regular basis. Therefore the creation of a Standing Army and of what size and duration, that must be paid by the Planetary Treasury (the combined Created Wealth of all that Realms Denizens) on a regular basis, will by those playing the roles and decision makers in the currently unfolding “Round of History”, have to be considered as the economics of individual Players are affected by those decisions. They may wish to sell their abilities as a Mercenary and enter a contract with Substantial Considerations from any other Player seeking to acquire their skillset and level of ability for any given task or round of tasks. A Mercenary is paid from Player to Player and unlike a soldier is paid one off at the start by the contracting Player for their services. A King of one of the Realms for a given “Round of History” may decide to hire a small group of specialized Mercenary Tradesmen as opposed to creating a Standing Army to deal with a combat event for the proven in game ability in previous rounds of being tasked through a story arc trajectory of each of the Mercenary Tradesman. As each “Round Of History” is repeated and the underlying Realm’s societies evolve. Objects are manufactured, discovered, invented and the overall wealth of each Planetary Realm is calculated. This is the Initial State for the next “Round of History”. The current Players taking on the main roles for this “Round of History” base their military and political decisions on what it will cost, which Denizens will cooperate with said decision and they will be constrained by the economic state the Realm is currently in and what may become of it if their decisions are followed through on.. In keeping with the analogy of the Narrative Storybook thematic the sequencing of events can be perceived of as Chapters, Sections and Paragraphs. Chapters are analogous to Scenes wherein they occur in the same environment and have a similar overall thematic trajectory, an Initial State and a Final State which determines the nature of the Initial State of the following Chapter. Progression though the Chapters occurs within the Sections which have the plot mechanisms driving the outcome or Final State of that Chapter. How this progression occurs is the Paragraphs which is the game mechanic used, how to use said game mechanic and why a particular mechanic is used as well as having an outcome from the use of said mechanic. At the beginning of each “Round of History” the Denizens of each Realm are notified that an event has triggered the cycle of The Prophecy. The Book is again about to be Written to. As the events along the multiple timelines progress relentlessly based on choices made by individual characters and economic viability the narrative arc for that Round of History is written to that Book. These are archived and stored in a Library as numbered volumes to be opened and read by any player at any time. Each time the story arc trajectory is run through it’s simulations from Initial State and progressing through to Final State a “Book is Written” and another “Round of History” has occurred. Though the decisions made and which goals are achieved will flavor the story arc of that particular “Round of History” and write that Book. Each subsequent round will have a wider economic base to draw from for Standing Armies salaries, skilled Mercenaries services and payment and Objects useful to achieving goals have been Invented or Discovered by the realms CraftBench Player. Narrative “Round of History” Objective. – This arc of the game is multi-timelined, meaning there are many possible arcs of trajectory as the storyline progresses from Initial State to Final State of each Chapter. Decisions made during the Chapter by each of the Characters representing the Realms they are performing for affect the nature of that Chapters Final State and this outcome drives the initial conditions of the next Chapter. Hence an individual decision, failure or success at a task can change the outcome for every other Performer in that Round of History. In this regards it is also a Strategy simulator. Your objective as a Performer for any Realm is to stabilize or grow your Realm Economy, enhance your Realm’s political and diplomatic status amongst the other Realm’s and prevent the marriage of Goldesia’ Princess to the Chief Demon. This goal of keeping the Sacred Bloodlines of Goldesia intact and not hybrid with pure evil ensure the delicate economic and political balance between the planets of their system remain intact for if Goldesia falls into the grip of this Demonic Chief Entity he has a Seat of Power to enact the Destruction of All Creation. Something even the most despotic of dictators would not wish for then there would be absolutely nothing to covet or wield power over. Worlds Simulation Objective. – This arc of the game is a sandbox Crafting, Manufacturing, Discovering and Inventing social and economic simulation. The economic inputs and outputs of each World Realm Economy are constantly measured via the Contracts for Substantial Consideration that have performed. This is ongoing below and behind the Narrative arcs in each Round of History progression. The wealth of each world will have a bearing on the decisions that can be made by the Performers for each Realm World in the Narrative. For example a King may have need of a combat group, whether composed of Mercenaries or Soldiers. Naturally the King would want to present overwhelming forces to assure victory. However the actual numbers he can field for combat are tied to the Realm Economy of which they are performing for. Non performing Denizens of a Realm go about their activities, i.e, sandboxing crafts, honorary challenges, contracting, as Performers play out a Round of History. A Denizen can participate peripherally in strategies by Manufacturing, Inventing or Discovering Objects that can assist their Realm’s Performers in a Round of History with a new weapon, gadget, magical object or technology that has not been previously introduced to assist in accomplishing an objective. A popular item will be Contracted for Substantial Consideration multiple times and hence grow a World’s Economic Realm which give the Realm Performers a larger funding mechanism to enact decisions with. A Martial Tradesman who is not a core Performer during a Round of History may be contracted by one of the performers as their Services were required to implement a decision by a Main Performer for a upcoming Event. Therefore it is in a Players advantage from an individual economic standing POV to upgrade and hone their skillset to become a sought after Contracted for Substantial Consideration combat specialist. One could become an actual Hero of The Realm through in game accomplishments rather than arbitrary assignment through choosing a character. Breadboard based CraftBenches per Tradecraft for Manufacturing, Discovering and Inventing. Unusual configurations of Discovered Objects can be patented as an Invention and Royalties derived from their Manufacture by another Player who may have a large Inventory of Raw Materials to manufacture from. Contracting for Substantial Consideration economics tracking system implemented to calculate the ongoing economic factors of each Realm World Economic Wealth, Import and Exports. Players are given the equivalent of “forty acres and a mule” after they choose a Trade and customize their Avatar to their liking when entering the game the very first time. The “forty acres” will comprise a chunk of terrain on the Planet they chose during their Avatar customization and Tradecraft choosing. They will own the mineral rights below this terrain they have Deed to. They can mine the Raw Materials or a Miner can mine it for whatever Substantial Consideration the mineral rights owner can bargain for. The “mule” will be the CraftBench or weapons set associated with their trade. Player vs Player combat can occur at any point by Honorary Challenges within Realms to establish ability and skills hierarchies amongst Martial Tradesmen. A round robin elimination styled challenge setup is used here so that experienced Players can only be challenged from below by those within their skill range. This avoids new comers taking shots at established Players until they have proven themselves. If defeated in the round robin elimination you are switched hierarchical positions with the victor and have to challenge your way back up the hierarchy through further victories. Substantial Consideration can extend into the real world if a Player has an accumulation of a desired Raw Material or Manufactured Object and another Player wishing to acquire such to his Inventory does not have enough in game Substantial Consideration the other player will accept. They can then contract for real world currency with the owner of the goods and upon completing the transaction the contract has performed and the goods transferred to the purchasing Players Inventory. Travel necessary for Performers can be Portal based Teleportation or they may hire Interplanetary Transport. Teleportation can only be done with a Player and their Avatars Backpack and worn items. Inventory items cannot be Teleported. Transport can be hired from Transport Operators and can Transport Avatars, Backpacks and Inventories. Transports are configured from Discovered Objects. As a Denizen you can freely explore all the Realm Worlds, interact with other Players and enter into Contracts for Substantial Consideration with them. As a Realm Performer you will be constrained to the pacing of events unfolding in the Round of History with your decisions, contribution to success of gameplay tasks driving the Narrative simulation and attention to the vagaries of strategy is necessary for the Narrative to unfold and the next Book to be written. Standing Armies can be commissioned on a salaried basis or Mercenaries contracted individually for Substantial Consideration. Standing Armies will consist of Soldiers who are Players in that World Realm’s Denizens who have chosen a Martial Trade and may not be skilled enough to warrant trying to contract out their ability as a Mercenary. Mercenaries have generally proven themselves in previous combat or ranking in the Honorary Challenges of their Realm’s Round Robin elimination PVP scenarios. Large scale battles involving Standing Armies and groups of Mercenaries may be commissioned by the current Heads of State of each Realm to satisfy the nature of the tasks they must accomplish based on decisions they made in the Round of History trajectory arcs. The ability to field large armies will be based on that Realms economic wealth and Martial Tradesmen within that Realm. Mercenaries can join into bands or Soldiers join squads composed of their friends so that they can do battle and devise strategies together. Bands of skilled Mercenaries may form into companies and contract their skills out to a Realm Performer. Realm Performers will be chosen from each Realms Denizens based on their individual wealth rankings, skill levels and other criteria. Realm Performers will commissioned from the Realm’s Denizens for each proceeding Round of History. If a Denizen Player does not wish to stop their current activities or feels they cannot devote the time the next highest ranking Realm Denizen under that criteria get’’s offered the role. In this way it gives all Players a chance to play the roles and see what they can do to change the outcome at the end of a story arc. When a Denizen moves into a Performer role all their possessions/inventory goes into Trust and cannot be effected by gameplay. Their payment for playing the role is a percentile of the Realm Economic Wealth achieved by their Realm during the Round of History. Arena Battles can be enjoined to test group combat skills and strategies. They will have a matrix of ranking similar to the Honorary Challenges individual Martial Tradesmen can undertake. Stamina, the ability to execute at a given speed for a given length of time before speed of execution deteriorates is calculated per Avatar by the length and level of activity within that game mechanic. The level of Stamina increases with time spent at that activity and decrease through inactivity over measured units of virtual time. Ability is also scored as an individual Avatar attribute and is calculated from successful strikes and strike avoidance during Honorary Challenges and Arena Combat scenarios. Strength to carry out the using of your Ability is calculated from your current health/damage factor levels, and calorie, H2O and O2 levels available. All of these personal Avatar Attributes and Properties will be available in the Players Dashboard and as well they can query others stats to compare to theirs or for deciding if they should be Contracted for Substantial Consideration for their services rendered. Platinumor – The people in this planet are very alien and demonic like. Gemzeon – people over here are very aggressive, very authoritative and living a very arrogant life. Pearline – very quiet and reserved and don’t talk to anyone. The Initial State of the Narrative Cycle, a Round of History, is begun and an upcoming event in the Realm of Goldesia signals the final unfolding of an apocalyptic prophecy. The Realm World’s within their Solar System will all be affected as it triggers the entrance to a universe poised on the brink of destruction, at the mercy of time. The Rival Realms are bound to the eternal cycle of an evil prophecy, sitting at it’s core a battle for the viability of Creation itself and one that mercilessly holds the cosmos hostage as it ruthlessly seeks fruition. Each of the four planets are endangered by the enthronement of this evil force fouling and making hybrid the Sacred Bloodlines of Goldesia and giving a Seat of Power to this Evil Entity in the physical worlds to utterly decimate and destroy them from. As a Realm Performer you guide one of the main or supporting cast of characters through the decision, tasks and journeys in support of your Realms prestige, economy and political standing in a Round of History. As Performers make decisions, have success or failure at a task, the Rival Realms Performers will react, sometimes with alliances and agreements, sometimes with combat or embargo and disagreement and perhaps sometimes for a Contract for Substantial Consideration such as Soldiers for a Standing Army in exchange for Raw Materials with another Realm. Whatever you choose or whatever task you accomplish as a Realm Performer will come to bear on the story arc trajectory of the Round of History being written to the Book as well as each Initial State, Progression and Final State of each plot, subplot and character arc creating the story arcs overall trajectory on the fly. The Narrative being just played through has it’s final state derived from all of that Round of History’s progressions and will determine the initial economic and political states of each of the Realms in the next round.. It will be fraught with danger, mystery, and betrayal, but glory is never achieved by paths of leisure, and history always repeats itself…does it not?? The exact same story can never be told twice as the initial and final states of each Realm, Realm Denizen and Realm Performer will always be different in relation to each other. The numbers of Objects, Structures, Technologies and Weapons available to implement new strategies of task performance, combat victories or economic viability will be continually evolving. Players skillsets and abilities will evolve and new champions with valued mercenary specialty skills will emerge within the Player community. New markets and commodities will be created which will drive Contracting for Substantial Consideration and new Leaders of Wealth in each Realm will emerge. Inventing and Discovering new Crafting methods and techniques leading to new items for Manufacture and distribution via Contracting will alter the economics of each Realm and can be imported to or exported to other Realms with Balance of Trade becoming one of the economic factors in determining a Realms Economic Wealth. A Lessor Arc of The Great Cycle has passed since the defeat and banishment to the Void of the Chief Demon Leviathan. Made dormant and constrained to an energetic cage marking the conclusion of The Great Crisis the upcoming astronomical configuration signals that the triggering of the events of The Prophecy are about to unfold. The energetic bonds confining this evil are weakening as the force of the Planetary Orbs wanes and Leviathan becomes animated with power. His final awakening and level of power at this culmination are linked to decisions and outcomes throughout the Narratives interactivity as decided by the Realm Performers in that Round of History. A series of ruthless selfish decisions would greatly empower the Chief Demon whereas a single cooperative gesture may greatly weaken him limiting his effects when unleashed into the physical Planetary Realms. Previous Rounds of History Final States may have left him bound weakly and still having great powers and levels of animation in the Initial State for this Round of History, thereby making this rounds Realm Performers face a more difficult and urgent set of circumstances. The Orbs can be thought of as Planetary Souls, each of an energetic that combined create a balanced system. The inherent power of each Planetary Orb is derived from economic, political and ethical factors as scored mathematically from the simulations algorithms ongoing calculations. This is visualized in the Players Dashboard and quick visual comparison can be done using a Widget utilizing color and scale and plasmatic spheres reflecting the underlying calculated measurements. These combined factors come to bear on the state of dormancy of Leviathan, his powers when unleashed and the strength of the bonds of his energetic cage. Individually the Planetary Orbs offer shielding from various forms of damage the Chief Demon and his legion can inflict on any individuals within that Realm. You will travel the Realm System, exploring the planets of the four realms, the flourishing lands of Goldesia, the eerie world of Platinumor, Gemzeon’s strife-ridden nation, and the secretive empire of Pearline. In the meantime, Leviathan paces his cage, eager for the moment that he can break free and begin a reign of terror. As he waits, he tempts mortals with promises of power, riches, and savior. Even some of the most powerful figures in the four kingdoms are not immune to Leviathan’s silver-tongued promises, even the King of Goldesia. When formless fetters have no holds and bonds of light are weak, the payment yielded to perform this act is all that I shall seek. Now payment comes when I perform or she continues naught. Your seed is pent up in your love and your bloodline comes to aught. Should I hold back the Reapers Scythe, or Death will then ensue, and she shall live though pain endured and deliver up your fruit, the pact is sealed, I have performed is how it shall be construed. Now payment comes when I perform at time I render due and currently your odds of paying down stand at one in two. For if a boy is issued forth no payment is in queue, but if a girl is the first born fruit the payment will be due. On either count your Queen’s life is saved to reign at the side of you. A pittance asked from future form and this will come to truth. In your garden a tree has grown and deep has grown the root and in a season it flowers forth then seed comes from it’s fruit. If payments due when comes that time then all that shall be done is to graft a branch upon that tree when flowerings time has come. When sealing this Pact of your own free will my Services will be rendered and on completion as above the payment will be tendered. The Terms of this Pact shall contain the condition that upon the graftings completion that the Heads of State of the other Planetary Realms be delivered with a Contractual Notice of The Grafting. This Contractual Notice remains sealed pending signing and sealing of this Pact. WITNESSETH: Upon The Consummation Of Declarants Wedding with The Bride. WHEREAS, any and all Items may or may not have intrinsic or assessed value, the value of such Items being determined by specified Parties. WHEREAS, such Items may be in the possession of specified Parties, and as such are subject to immediate forfeiture, seizure and/or transfer to the Secured Party hereunder, also listed as the Declarant. NOW THEREFORE, in consideration of the absolute and incontrovertible nature of the heretofore and the henceforth hereunder, all Parties shall subrogate immediately and simultaneously upon receipt of this document without delay, protest, prior consent or written/verbal agreement. Furthermore, Declarant hereunder reserves in advance an exclusive Divine Right to enact and enforce the provisions hereunder, and shall not be subject to any such provisions. Upon receipt of this document, any Items owned by any Persons or Governmental Authorities, including such Authorities themselves, shall immediately be in receivership to the Declarant. Items are subject to transfer to Declarant without notice, demand, protest or prior written agreement. No Party shall have claim against Declarant for damages or any other alleged violations. Upon Declarant’s receipt of all Items, such Items will be subject to a Lien or Liens, with the Declarant listed as Primary Lien holder and Secured Party. Any previous Lien holders shall subrogate without protest, and their notes of debt shall then become payable to Declarant. Any attempt by any Party (excepting the Declarant) to wrest control or ownership of any Items seized by Declarant shall immediately be deferred by whichever office is petitioned. Such attempts shall be construed as Encumbrance of Items Forfeited, and shall be prosecuted accordingly as per Paragraph 2 of the fine print section below. Parties acknowledge that upon any such attempt to wrest control of the above listed Items from Declarant through any venue, they shall be in Material Breach of Contract and will willfully default all of their possessions to the Secured Party and draw their last breath. Last breath will be subject to a specified percentage of royalties that will become due to Declarant from violating Party’s next of kin pursuant to Declarant’s receipt and ownership of the “Air” as an item listed above. These royalties shall be calculated on a sliding scale, whereby the assessed or intrinsic value of any Item used in violation of this Declaration becomes due and payable to Declarant. See payment section hereunder on the following pages. Unauthorized use of Items is specifically defined as “Use of Items by any Party excepting the Declarant”. Any unauthorized use of such Air or any other Items by any Party without prior receipt of sums due to Declarant for royalties constitutes a Waiver of Power of Attorney. Unauthorized Parties shall be detained indefinitely at an undisclosed location to await secret hearings, which have been postponed. Claim of ownership will be re-filed under Declarant’s name at the expense of the violating Party. This debt is non-transferable, and shall not be payable through any type of Valuable Consideration or Notes of Debt. This document shall be construed under its own terms, and constitutes an Irrecoverable Defeasance on all other Agreements, Collateral, Corporations, Deeds, Estates, Instruments, Liens, Private Collections, Securities, Valuable Objects (including Gemstones, Engraved Stamps, Paper Currency, Bullion, Coins, Rare Earth, Precious and Semi-Precious Metals). Parties submitting payment in Notes of Debt or Valuable Consideration for above expenses resulting from resisting scheduled forfeiture and seizure of their Items shall owe an amount 7% greater than the payment submitted. These additional sums shall be assessed upon Declarant’s receipt of payment, however payment of these additional sums is due 10 days prior to Declarant’s receipt of 1st installment on such expenses, pursuant to Declarant’s whim. As such, any additional sums are late and shall be subject to a penalty fee equal to the amount due, thereby doubling the amount due, which shall then immediately be re-assessed and adjusted for additional penalty fees as defined herein. Re-assessments will occur automatically and continuously without any delays ad infinitum. If any assessment or re-assessment of amounts due occurs at any time, the Parties are automatically in Default and shall be bound to the terms outlined herein below regarding the same. Receipt of this document by any Party other than Declarant constitutes tacit agreement to enter into an Agreement for Material Breach of Contract. Parties in receipt of this document have automatically and subsequently agreed to the terms of the Agreement for Material Breach of Contract, which is a Contract of Adhesion and shall not be attached herewith for any Parties to review. Parties are bound to the terms of the Adhesion Contract, but hereby waive any and all rights to review their obligations, and as such shall be marked in Default for Failure to Perform under the aforementioned Adhesion Contract. No details of the Adhesion Contract may be disclosed to any Party until they have accepted the terms of the Adhesion Contract and thereby waived their right to review such contract. Receipt and subsequent agreement to the terms and conditions of the Adhesion Contract is automatic, irrevocable and unconditional. The Parties, having entered into an Agreement for Material Breach of Contract, further acknowledge that their individual and collective rights as citizens, shareholders, sole proprietors, corporate officers, or more generally as Human Beings, have been fully extinguished. This acknowledgement is automatic and unconditional, said extinguishments of rights are irrevocable and irrecoverable by any Party. NOTA BENE:The provisions herein are effective 10 days prior to the Parties’ receipt and acknowledgement as per the Adhesion Contract. All provisions in the above section pertaining to acceptance of Adhesion Contract terms are non-negotiable and shall supercede any and all vetoes, orders, international treaties or summits, tribal council meetings, resolutions by any multinational organizations, boycotts, personal grudges, vendettas, blood feuds, case law or any legal precedents used to contest this document, decisions by any legislative or judicial entities at any level of jurisdiction, other declarations, prior agreements or contracts. No Mark of Reprisal or other such document shall grant authority to any Parties (excepting the Declarant) to take any action including but not limited to legal filings, physical violence, character defamation (including Defamacast over the airwaves), public or private protest, editorials and other opinion articles which do not cite this document as grounds for their subrogation, vituperative effluvience, black-bag operations (foreign or domestic), assassination attempts, encumbrance or general utilization of any seized Items through Unauthorized Use as outlined herein above. As per this Declaration and the Terms herein, any attempt at subterfuge as described in the above sections shall be persecuted beyond the fullest extent of the law. Parties attempting any form of subterfuge will be detained pursuant to the Terms set forth on Page 2, Paragraph 2 of the fine print section regarding Unauthorized Use of Items. Declarant reserves the exclusive right to choose the Venue for such proceedings, and shall act as the deciding official upon appearance at such proceedings pursuant to Declarant’s seizure of all Governmental Authorities. Declarant shall act as Judge, appoint himself to the Jury twelve times over, convict and personally execute any Parties attempting subterfuge. As per the above section regarding Agreement for Material Breach of Contract, and the Parties’ automatic, tacit agreement to and acceptance of the terms contained therein, all Parties are immediately in Default for Failure to Perform under the Adhesion Contract. Upon receipt of this document by any Parties, a Default will be opened; receipt of this document is automatically construed as an Event of Default pursuant to the terms herein. Default are null and void. Parties may be forcefully removed to an undisclosed location as described above at the sole discretion of Declarant. Parties in Default [Read: All Parties] acknowledge that their Items as itemized above are subject to immediate forfeiture, seizure, and/or transfer without any prerequisite notice or agreement. Any Items forfeited to or seized by Declarant shall be subject to Auction on the first Tuesday of each month in front of any selected Courthouse; Declarant is the only Party allowed to bid at such Auctions. Upon Sale of these Items, Declarant’s possession of such items shall be restored due to the above stated provision. All Parties hereby agree to indemnify the Declarant against any potential loss as a result of any violations of Item Use Provisions, or any other violations of Anti-Trust Covenants as per the Adhesion Contract. Time spent on handling Item Use or Anti-Trust Violations that inhibit Declarant’s ability to enact and enforce any additional provisions under this document, thereby inhibiting the transfer of additional Items to Declarant, shall be charged back to the Parties at Fault at the rate of 100% per annum plus other additional expenses. Given the space operatic settings and flavor of the story’s trajectories the use of classical painterly colors, shading and lighting effects, the visual sweep of the narrative is intrinsically enhanced by the stylized rendering of the environments the Player will be immersed in on their individual journey through the realms as they unwind the narrative in their own way via their unique set of choices along the story arc trajectories. This can be presented through the Crafting and Recipe module and interactive environmental objects. They should be logically based even though the technology may be something magical or entirely alien to our earth technology.. Scientific understanding can run from the totally material to the metaphysically spiritual but involve universal principles and elemental properties. Each material has a special energetic relationship with every other material. With basic realm setup and rules the community can populate and build these realms from raw materials based on the skills their particularly chosen realm may offer under its social guidelines. Players, without a compelling reason to explore a game world may become easily bored of the game as if it is simply a sight-seeing tour. The nature of the environment, forced interaction, such as attacks or dialog sessions wherein the Player is queried or given a clue as to how to proceed or what to know to achieve a specific goal can arouse curiosity in the dialoguing scenario and force Player interaction or see their Avatar wounded or killed in the case of an attack. Both the collecting of Crafting Materials and the piecing together of the lore and mythos of the planetary realms from various books, stone tablets, temples and statuary etc. will, by necessity to complete game play goals force the Player to journey and explore the nooks and crannies and open spaces, buildings and other contrivances of the various realms environments. As they proceed along the gameplay and storyline trajectory they are going to create their unique interaction with each of the realms and gather a version of the story based on the sequence of their interactions. This can lead to each Player understanding the story from a different perspective or the same Player having a different experience the second and further times they play the game. This is tied somewhat into Materials Crafting but also extends into making items in the environment interactive based on collision or proximity or perhaps possessing a key to a lock or switch mechanism. The environmental object should not be mute or simply pretty meshes with great textures. What can they do? Does it sing, rumble or pulse when interacted with. Does it project images of lore or prophecy. Is it a trap that is triggered. Does it manufacture, synthesize or teleport objects. Does it have abilities to broadcast or eavesdrop at a distance or scary distant events. Is it fun to just mess with. Each of the realms has different politics. These would be for example, the issues or resources or spiritual goal they would go to war over, the management of the realms economy, diplomatic negotiations or the nature of the hierarchy of command with a range from dictatorial despot and a brutally enslaved population to benevolent King with sovereign citizens equal to the King under law to a holographic social structure as opposed to a pyramidally based hierarchy..
A realm economy is an essential component of any social structure. Within an economical structure items are traded based on the intrinsic assessed value of said item by the seller/trader as met by a buyer/trader. Services/Skills can also be traded for items or exchanged for other skills with other Players through Contracting for Substantial Consideration.. This is an area that can engage a Players interaction with the elements of the game by involving them in comparative thought processes and needs based on current and future goals or experience from previously attained goals. Oftimes an in-game economy becomes robust enough to generate real world auctions or purchasing of assets with real money other Players have collected during their game journeying. It is also entertaining to watch an economy evolve via Players input..what they trade for..what they consider to be relevant and other related considerations.This also gives the Player the ability to achieve an in-game trade that can generate in-game currency/materials by processing various raw materials according to a skillset. Think blacksmith, alchemist, jewel facet cutter, carpenter etc. The Orbs are central to the main protagonist/antagonist dilemma. They have various capabilities and affect various realms of being i.e spiritual – the demonic pact and its rewards, pitfalls and ability to control animation and binding of Leviathan. Political- when required by one of the Royals to facilitate what is essentially political. Behind this lies the spiritual repercussions of wrong use of power, of which the Orbs appear neutral but driven by a beings intent. Physical – in that both of the previous realms decisions ultimately end up in their interaction in the physical realm wherein the Avatars physical being is endangered or empowered as per intent the Orb was used or set up for. In this regards the gameplay ongoing throughout the game should perpetuate the focus on the Orb power and its facilitation as one method of driving and engaging gameplay.. There is a possibility to use this in a manner to engage the player by metaphysical self-identifying with the nature of the Orb. Activities that would empower a living being, victory in armed combat against a heinous foe, saving the life of another being even if unworthy “for even evil can be taught the great ways of good”.. the gestures of love and affection, physical and mental endurance against great odds and coming out on top…all of these things can be incorporated in the gameplay for constant interaction with the Orb’s state of energetic alignment. The ability to facilitate powering or release of focused power from the Orbs can be skill based, giving a reason for Players to go through various scenarios to earn a skill badge based on the type of skill used to defeat that scenario, whether puzzle based, journeying or combat. As well a Crafting system can be used to gain access and control of an Orbs powers. The backpack is for items carried and Inventory is for the entire set of possessions. The weight of each item can be estimated based on real world mass and dimensions. The Player can carry a given ratio of weight based on their strength levels and the carrying of weight can affect the stamina to strength ratio and caloric needs of the Player Avatar. Crafting items are stored to Inventory when found and can be used in a Crafting Module to realize Recipe configurations. Weapons handling will be performed in a very similar mechanic for each weapon. RightMouseDown – allows lookAround by head and upper torso to be driven by screen sector. If the mouse cursor is in the lower left screen the Avatar looks to the lower left and if in the upper right looksAt upper right forward of their location. This can be considered a global coordinates action based on the camera frustum plane and when the RightMouseDown is activated in one of the nine screen sectors the avatar looksAt that screen sector forward of their position. In combination the two mouse down modalities provide the ability to be in a stance and swivel left and right and look up and down with the upper body with feet planted in current stance by use of RightMouseDown and wielding the weapon to the direction the upper torso and head are facing towards by LeftMouse local swiping speed and direction polled from frame to frame. The Weapons Categories are as follows. Armor and Accessory customization occurs per slot and an associated “GingerBreadMan” is set up to register and visualize through green to yellow to red color changes per slot with red being dangerously damaged, yellow is somewhat disabled and green is healthy with full strength and prowess. Armor weight is added to Backpack for armorial slot additions. Skill with weapons can be built up like katas with each kata being a unit of movement with a start and finish and the katas can be strung together to create chains of motion that can be triggered with a single input. If a Player collects several katas they can be given a block based editor where each block represents a kata unit and the units dragged around the Kata Editor timeline to create complex chains of movement which can be set to be triggered by any key the Player chooses to use. Since much of the combat is melee based the underlying mechanics of the weapon types and damage, physical prowess, strength and endurance come into play to create an engaging combat experience. The mechanics of the user swinging a sword or thrusting a spear, drawing back and releasing an arrow from a bow, throwing knives or lobbing projectiles as well as any point-aim-fire type weapons that cause damage at a distance should be set up to be maximally useful without learning an entire new scheme. Left and right mouse buttons and the four basic navigational direction keys, either WASD or the Arrow keys should be used with very similar functionality and even if never having wielded the weapon prior should be able to generate strikes and blocks with simple intuitive mechanics: swipe left and the weapon strikes of blocks left; swipe quicker and weapon moves quicker. Skill with weapons can be built up like katas with each kata being a unit of movement with a start and finish and the katas can be strung together to create chains of motion that can be triggered with a single input. If a Player collects several katas they can be given a block based editor where each block represents a kata unit and the units dragged around the Kata Editor timeline to create complex chains of movement which can be set to be triggered by any key the Player chooses to use. The planets were created together to live together. 1) Goldesia: Rich in Gold, very luscious lifestyle and very friendly people. Filled with joy, love and happy people. King Valimiki ruling the planet and is a very noble King. 2) Platinumor: Rich in platinum. King Pegason is ruling the planet. The people in this planet are very alien and demonic like. 3) Gemzeon: Rich in gemstones – Diamonds, Emeralds, rubies and sapphire. King Zanshe is ruling the planet and people over here are very aggressive, very authoritative and living a very arrogant life. 4) Pearline: Rich in pearls, Queen Agatha is ruling the planet. The people in this planet are very quiet and reserved and don’t talk to anyone. 5) The Cage: an empty platform made in stone that floats above an empty space, surrounded by black void. On the platform there’s a table where the demon lies when he’s dormant. Above him there’s a glowing sphere that is the fifth orb. In front of the table there’s a mirror, the entrance to the cage. This is involved in the political and social elements of the game and can be developed by the Players themselves as opposed to a preprogrammed structure. Politics make strange bedfellows as the saying goes. In the gameplay and story trajectory reversals of alliances are possible where an alliance at one point may be beneficial with a social group who would normally be an enemy. Mercenary type alliance can be bought and sold depending on which social grouping you are dealing with and their ethics levels based on their realms lore and mythos. the squad will gain collective experience to use to upgrade each of them every way you want to. Crafting involves the use of raw materials in the class of materialsComposite and gemstoneComposite to be configured in the Crafting Bench Module with energeticComposite circuit flows activating various functionality. A successful configuration will have an output based logically on the various components and the order of their configuration and energetic and material combinations. Crafted Items: Objects can be crafted/configured according to RECIPES. Though there will be several stock RECIPES included and can be referred to for templates for further RECIPE Inventing on the particular Trades CraftingBench is implemented. These RECIPES can be bought and sold as well as the items configured. Depending on the Crafter particular trade the bench will be equipped with tools and measuring apparatus accordingly. Composites will be treated like circuits with inputs and outputs relevant to their materials or energetic types. Configuring materialsComposites with energeticComposites and gemstoneComposites will produce a flow through the circuit which will be described mathematically so the SFX, sound and damage or protection can be determined from use or discharging said device or configuration. Each TradeCraft will have workbenches and tools and measuring gauges appropriate to their crafts materials. They can configure items through Inventing or Discovering active configurations or by using RECIPES already in place or purchased from another Player/Denizen of A Realm. In this manner any kind of object can be fashioned by various TradesCraft workbench activity and allows for massive innovation based on real world scientific principles, materials combinations and energetic flows. The CraftingBench then becomes an Inventor Laboratory of sorts as they can try any configuration that can plug into each other if machine or circuit based and gauge output level and type. No machine and circuit based items like armorial outfittings and manual weaponry can be fashioned from units of Materials and their durability and ease of manufacture is based on the materials hardness, durability and ductability. Each item manufactured in these classes will need so many units of raw material to be able to construct. For example a wrist gauntlet may take 0.5 units of raw Material and torso armor may take 4.0 units. The weight of the armor or weapon is derived from the material it is constructed with and the number of units used to make said item. The ability to inflict or inhibit damage is based on the materials durability rating. Materials can be mined, traded or purchased. This CraftingBench module can keep Denizens amused for hours and allows for brilliantly unique configurations to be constructed in an electronics breadboard fashion. The possibility to have non-functional gadget or technological configurations is quite possible but does not eliminate the Player from further progress..they can continue to attempt various configurations till successful or determine they may need other materials or energetic composites to complete a circuit configuration and have some sort of output that can have an effect within the game world and game mechanics. Since the various planets holds different mineral resources the collection of various precious metals, gemstones and pearls can be used to drive journeying in the gameplay. Taking the inherent natural properties as we humans understand them in our science myth and lore. Gold is the sweat of the Sun. Since the Sun drives the Orb charging then the possession of gold can lead to the ability to charge an Orb. Rubies are used in lasing light, giving it a highly focused and coherent beam. This can be used to provide focus in discharging an Orb at a specific target. Diamond is hard and can cut as well as being refractive with an internal crystal structure resembling the Merkaba of Creation. Diamonds are given by the male to the female as a gift in anticipation of an upcoming joining or marriage. This could facilitate the interaction between the main male and female protagonists. The use of the diamond with an Orb could be to refract a single orb into a grid with many smaller Orbs appearing at the facets of the diamond to be wielded as a technological/magickal device. The pearl represents wisdom and brilliant ideas. Perhaps until a “Pearl of Great Price” is obtained any attempt to wield the Orb powers will also have an empowering or awakening effect on Leviathan. Platinum in combination with Gold amplifies vibrational rotations by the power of three as per Keely’s work in the late 1800′s. By utilizing the collecting of various materials from the planetary realms, along with a “Crafting Bench” and “Recipes” for the assembling of said materials into various weapon and magickal or technological configurations the player is driven from task to task and has to journey from realm to realm to collect the various materials for completion of a Recipe. By adding these completed items to the Players inventory (total possessions) and Backpack (carried possessions) they have the ability to take on one of the tasks relevant to the extension of the storyline towards its conclusion. Some of these recipes may be common lore or knowledge whilst more powerful or unique configurations can only be derived after finding a it in a discovered book or blueprints from a stumbled upon Alchemists lab as a few examples. Less complex but “functional” configurations will be able to be “plugged in” to each other configurations to extend a devices powers or weapons abilities or a Players skill level at a particular skill congruent with the crafted items. Since the plot line is intricate and hordes of cutaway scenes to explain things in a story telling manner distracts from core gameplay the use of books, hieroglyphically inscribed temples, perhaps Player proximity activated holographic displays can be used to convey much of the undercurrent in the storyline. Again, as with the Crafting it sends the Player on a quest to explore the realm they are in to seek out these items so they can competently proceed along the storyline trajectory through gameplay. Each item of lore/myth/prophecy should mention other items and give an incomplete picture of the whole scenario in a puzzle piece manner and when a group of these are assembled and comprehended the Player can use the information to advance themselves within the framework of the game and the trajectory of the storyline. The above is rather ambitious, but Arrianna Publishing was going for 800K USD on their KickStarter. They had financial backers already as well. They held a huge party in Atlanta and had hired Titan Entertainment or the PR. I was interviewed by the game press at the party and got half drunk for the first time in years as I don’t drink much..been here and done it all in my younger days..but an open bar and my favorite beer, Sam Adams, with the bartendress insisting I do shots with her and well:). The KickStarter kicked off the next day. I had to move to a new place and wanted to be situated when the hard work began. When I got the phone bak on I tried contacting Arrianna publishing and could not get a reply for three days. When i finally did I heard a sad tale that they could have easily avoided by following KS guidelines. They had over 24,000USD pledged inside the first 36 hours and the fools sent out an email blast and complaints were lodged against them and KickStarter pulled the plug. The CEO of Titan had warned me at the party hat we had to watch out as certain elements in the gaming community were mercenary. I guess he was right. Had I been available to consult on the email blast my answer would have been a very firm NO!. Do not give them any ammo to shoot with or they will empty the whole magazine into you with glee.